The first time I made blueberry compote I was reminded of the inside of blintzes. 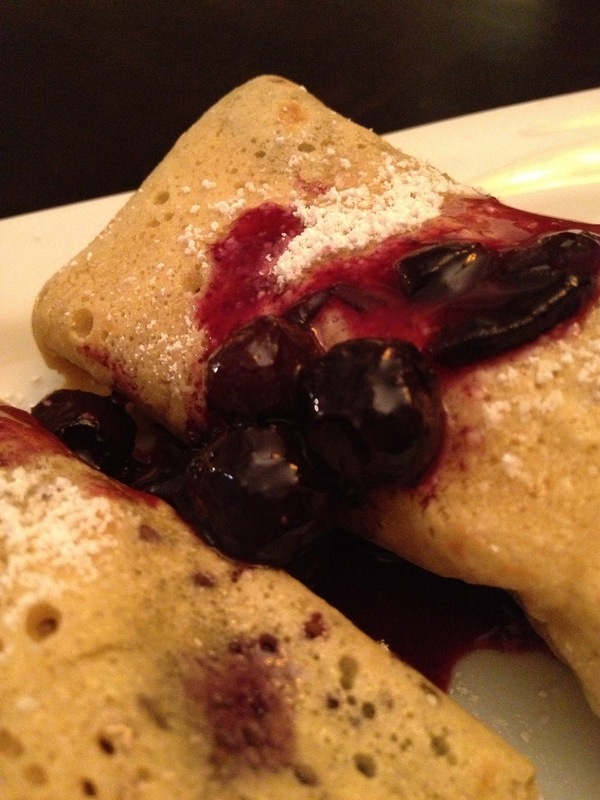 Blintzes are Jewish crepes that are filled with several different fillings including blueberries. So I combined my recipe for sweet crepes with the blueberry compote to make blueberry blintzes. My mother is impressed! Combine 3 cups of the blueberries with the sugar, water and lemon juice in a small pot. Cook on medium for about 10 minutes until the blueberries start to soften and break apart a little. Add the rest of the blueberries and the arrowroot powder, cooking until the compote coats the spoon. Refrigerate until ready to use and heat before using. Combine all of the ingredients for the crepes in the blender. Brush a non-stock skillet with grapseed oil and heat it up. Pour the batter into a 1/4 cup measuring cup and pour onto the hot pan. Quickly lift the pan off of the heat and tip it around to spread out the batter. Return to the heat and cook until the edges become brown. Using a spatula, flip the crepe over and cook for about 1 minute. Do the same for all of the batter. 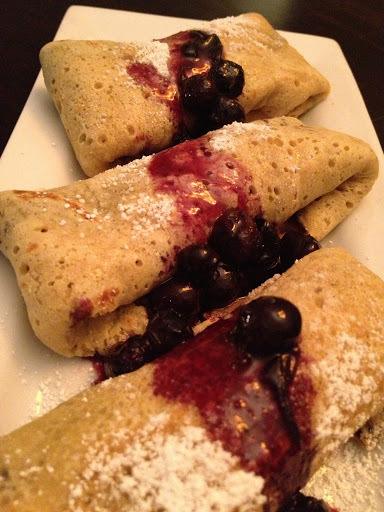 To assemble the blinztes, place a few teaspoonfuls of blueberry filling at one end of the blintz and then roll it up. Tuck the edges under and place on a serving dish. Dust with powdered sugar and top with extra compote. Enjoy! * Five blintzes will use approximately 1 cup of the compote. Use the rest on vanilla ice cream, to top a nice piece of cake, or freeze and then heat up when ready to use.